Every room has: Active fire protection, air conditioning, room air distribution, in-room safe, mini-bar, direct dial telephone, tV set (plasma displays or screen of 28-32-42"), tV Sat, Sky TV, internet Wireless connectivity and room service. 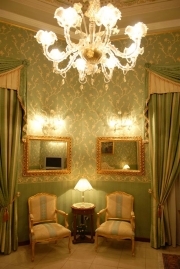 Villa Romeo is a three star hotel, but it has all comforts of a four star hotel. It manages to combine quality with good price. In the main terrace, especially in the summertime, you can enjoy a nice atmosphere and spend pleasant moments talking and drinking. The hotel is richly decorated: the elegant entrance; the artistic stairs; the big (8/10 people) panoramic elevator; the corridors with precious and refined panels with golden frames; spacious rooms with elegant furnishings; the private terraces; the bar and the TV room. In the hotel you can breathe a luxurious and elegant atmosfere.